Welcome to Stop 39 & Chapter 39 of the Consequences Audio Tour! 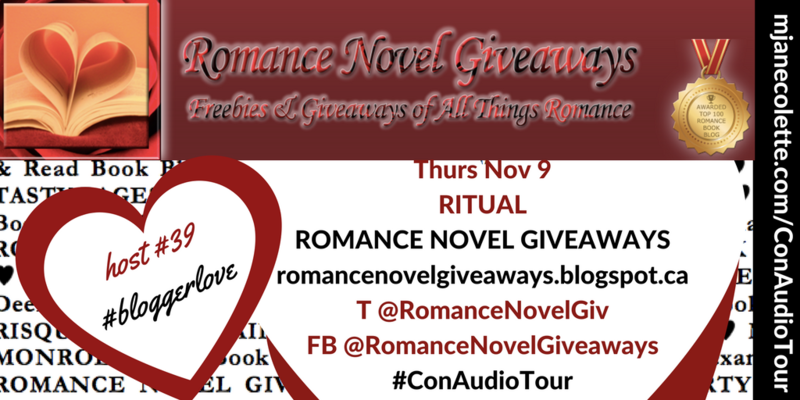 If you’re in a hurry to listen to Chapter 39: RITUAL, run to ROMANCE NOVEL GIVEAWAYS RIGHT NOW! Me: Run run to ROMANCE NOVEL GIVEAWAYS to find out! Launched in August of 2013, Romance Novel Giveaways has been providing quality promotional blog posts to authors in the adult-romance novel genre ever since. With an average of 16,000 monthly page views, Romance Novel Giveaways was recently ranked on Feedspot’s Top 100 Romance Book Blogs and Websites for Romance Readers and Authors. A former paralegal, I am now a stay-at-home mom with a passion for cheering on my Cleveland Browns (hey, there’s always next year), binge-watching Star Trek: The Next Generation and, of course, reading! I’m so thrilled Romance Novel Giveaways accepted the invitation to be of the Consequences Audio Tour, and I hope Romance Novel Giveaways’ readers enjoy the RITUAL chapter, in which you find out what Christmas means to Elizabeth. Hey, look at that—I came up with a teaser that wasn’t a spoiler! Thank you, ROMANCE NOVEL GIVEAWAYS ! And now, head on over to the blog to listen to–and read–Chapter 39:RITUAL. THANK YOU for such an AMAZING spotlight!!! I can’t tell you how much I appreciate this!! !